C8061X MICR - HP 4100 MICR Toner - RC4100+RM - For use in HP LaserJet 4100, 4100 mfp, 4100dtn, 4100n, 4100tn, 4101 mfp printers. Page Yield: 10,000 @ 5% coverage. Premium New Modified HP black C8061X MICR toner cartridge used for check printing in HP LaserJet 4100, 4100 mfp, 4100dtn, 4100n, 4100tn, 4101 mfp printers. High Yield, 10,000 pages. 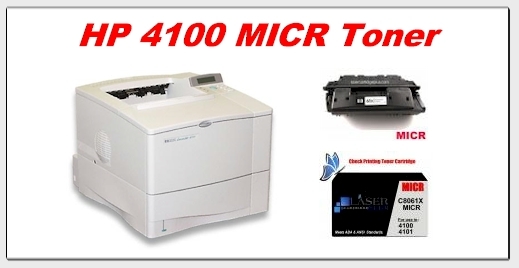 You have found the best source of * HP 4100 MICR Toner * for use in all HP LaserJet 4100 Printers.